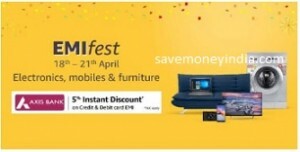 Get 5% instant bank discount on Axis bank Credit Card EMI and Debit Card EMI, on purchase of select products from April 18, 2019 to April 21, 2019. On the payment page, please select your saved Axis bank Credit Card/Debit Card and check whether the transaction is eligible for EMI or not. If yes, please select the desired tenure and proceed. Fake deal taking 14% EMI and giving only 1500 off. Go for no cost EMI..